The HEINKEL Group offers an upgraded control system which uses HMI control panels based on the Siemens S7 TIA control system. With its advanced functionalities and remote maintenance unit, the control system increases the safety, reliability and service life of the machines and systems. A modern user interface and simple system extension ensure more convenience and flexibility, with low changeover times increasing productivity. In addition, the control system fulfils the latest FDA and GMP regulations. With integrated safety and security features, it guarantees compliance with both IEC 61508 and EN ISO 13849. Faults, downtime and costs are reduced thanks to remote maintenance worldwide with fast troubleshooting and delivery of spare parts. Moreover, the control system can be linked to an existing higher-level process control system over an Ethernet or Profibus connection, allowing ideal process control as well as the storage of process and product data. This results in an overall improvement in product quality. 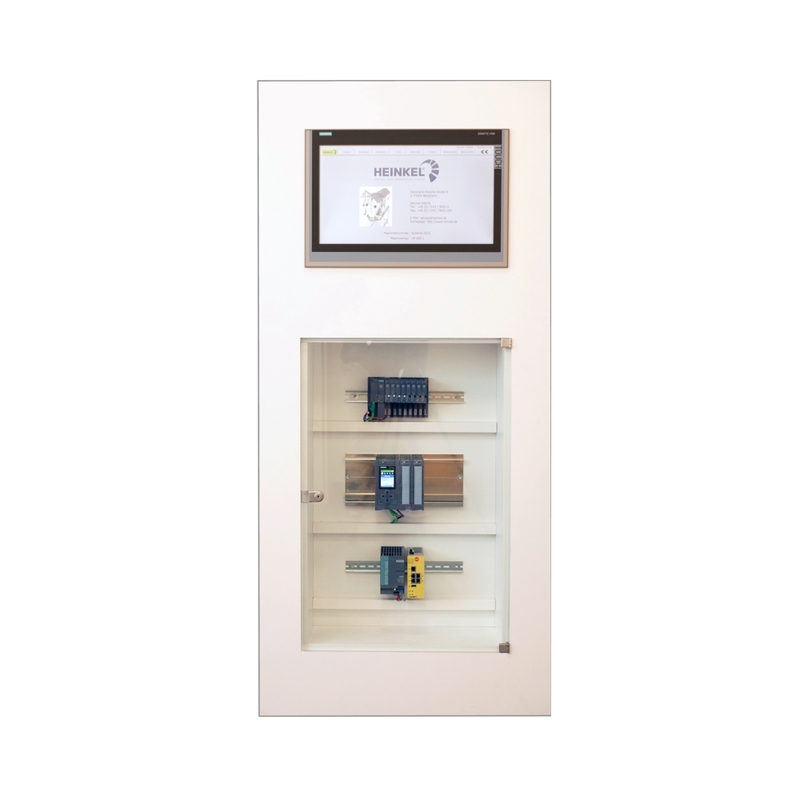 The HMI panel and S7 TIA control system can also be used for third-party brands and adapted to individual requirements. The control system realises the functions necessary to operate the centrifuge, (filter) dryer and mixer as well as all safety-relevant monitoring. System data is accessed, and the various system parts as well as operating and maintenance interfaces visualised, via the HMI panel. Integrated recipe management enables flexible, customised input and composition of the recipe sequence. Control takes place in four operating modes. In manual mode, the process functions can be powered on and off by hand. This gives the operator maximum flexibility to adapt the machine to changing product characteristics, for example during the trial phase or in multi-purpose operation. In semi-automatic mode, recipe steps can be selected and started individually. The optimal automatic operating mode can be determined in this way based on the relevant product characteristics and the recipe management parameters. The control system waits for the next user input after each work step. In automatic mode, the recipe saved in the control system or a separate PCS system is executed completely autonomously and repeated cyclically. No operator intervention is necessary and the maximum product yield is achieved. Upkeep and cleaning work can be carried out in maintenance mode. For safety reasons, this is controlled from a local panel. The machine functions are easy to customise and can be extended individually. The control system has a remote maintenance unit via which service technicians can optimise processes or analyse faults anywhere in the world. This ensures system availability and avoids downtime, saving both time and costs: problems can be rectified from a distance at the push of a button. A secure and encrypted VPN connection which can be controlled by the customer is set up for this purpose. The Simatic TIA Portal enables modern control technology to be utilised very efficiently. The control system permits a rapid response to market changes and the ever shorter product lifecycles associated with them. 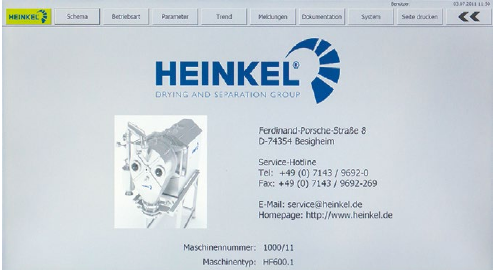 To guarantee operators access to all the latest process control engineering functions, HEINKEL Group offers an additional service for upgrading older control systems to Simatic S7 TIA and helps customers plan and manage the migration. By upgrading to a newer system, they protect their investment in the long term. The more advanced technology reduces the risk of machine downtime and reveals new potential for optimisation.